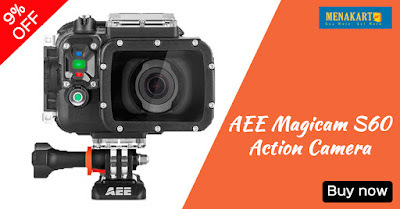 AEE Action Cam S60 is our highest speed 1080p action camera. This camera is has all the features of the GoPro Hero 3+ Silver but includes better specs and accessories at lower price. It's a compact, waterproof camera capable of shooting HD video and taking 16 MP photos. It comes with a waterproof remote control, waterproof camera housing and 2" LCD screen included. High Quality Features in Tough Package The AEE Action Cam S60 Waterproof HD Action Camera boasts some impressive features. Capable of 1080p60 recording, your videos benefit from true HD quality and with an ultra-wide 155 degree angle, you're guaranteed to capture all of the action. For fastest motion capture, the camera can capture 120 fps at 720p. Waterproof Camera Housing The camera includes an IP66 waterproof camera housing that, as well as providing extra protection to the camera and lens, allows the camera to be used underwater up to a depth of 190 feet. Detachable LCD monitor With the 2" LCD monitor attached you can see what the camera is seeing. The TFT monitor also allows playback of existing footage, so that you can review the video/images you've taken or show what you've taken quickly and easily to your friends. Specifications. IP66 Waterproof housing, dust tight and heavy sea rating. 155 degree ultra-wide angle f/2.8 lens. 1080p/60 fps, 960p/60 fps, 720p/120 fps. 16 MP still images. 8x digital zoom. Multiple shooting modes including time-lapse and 10 photos per second fast-shot. Waterproof remote control up to 30ft with clip and strap attachments. Detachable LCD screen to compose shots and view playback. 2 exposure modes average and center for complete lighting control. Built-in microphone and support for external microphone.